I have an image taken using a mobile phone like the one attached below. Let's say that I know the location(lat/long/alt) from where this image was taken, which is probably the center of the red circle (lets say pixel x,y), annotated in this image. I want to have any suggestions on how to go about estimating the approximate lat/long/alt coordinates of the annotated traffic signal? 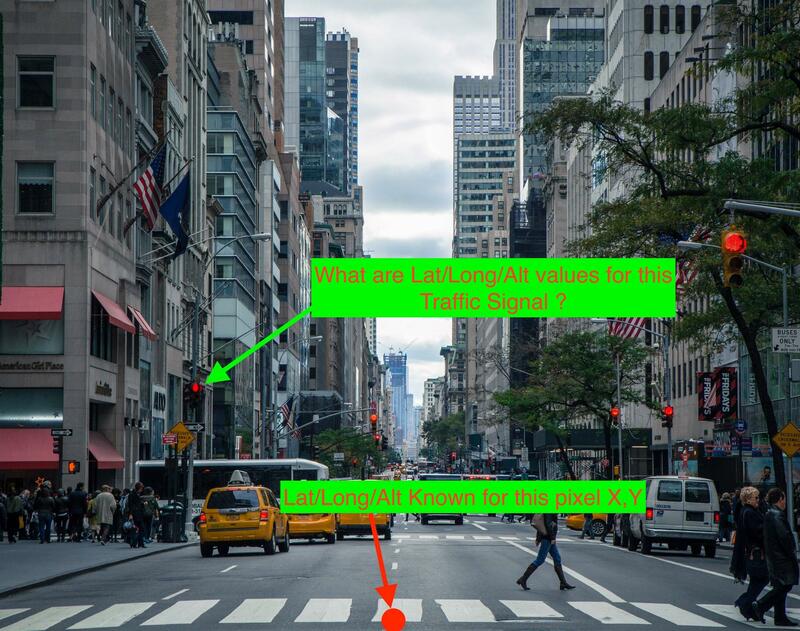 IF you know the look angle (azimuth) of the photo, you can try to estimate 1) how far away the traffic signal is from the known point - maybe 60 feet - and 2) the height difference of the two points - maybe 15 feet - and then just do the trig. This is known as a First (direct or forward) geodetic problem and there should be resources out there for that search term. I imagine it would be easier to convert your data to a projected coordinate space so you can use planar math rather than trying to work with geographic coordinates. Not the answer you're looking for? Browse other questions tagged geometry geolocation or ask your own question. How to get lat/long from Google Analytics when country but no city given? How to calculate degrees per pixel in a given image? Or .nth of degree? How to determine ring orientation from lat/long coordinate points? How to calculate the start and end lat/lon of a linestring which is not a part of a ST_buffer?